Just 49 years ago, the Reds captured their 4th pennant, besting the recently relocated (LA) Dodgers and (SF) Giants down the stretch. Five of the eight NL teams finished over .500 that year and the Pirates fell just short, thanks to doormat seasons from Chicago (64-90) and Philadelphia (47-107, oucheroo). Cincinnati manager Fred Hutchinson won his only pennant in 1961, just a few years before his untimely death at age 45. Much-loved for both playing and managerial success, he's memorialized by a cancer research center (started by his brother, a physician) in Seattle. The Reds retired his number 1 and inducted Fred into their Hall of Fame. 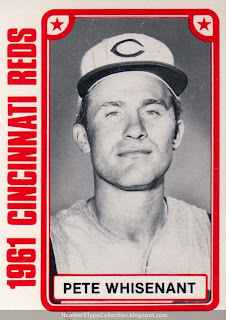 The Reds outfield didn't need much beyond Frank Robinson, Vada Pinson, and Wally Post in 1961, so Pete played sparingly. He retired as a player following the series and served as a full-time coach for the 1962 season. 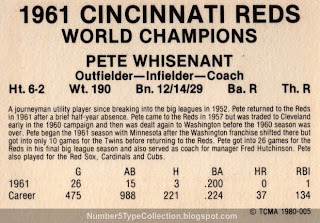 Value: Pete cost $2 on Beckett Marketplace, about average for 1980 TCMA sets. Frank Robinson's the star for this team set and costs $5 to $10. Fakes / Reprints: Haven't seen any reprints in the market and it's probably not worth faking.